\nBorgo Panigale, Bologna, 21 January 2019 – The Borgo Panigale plant has begun producing the new Diavel 1260. The first bike rolled off the line on Monday 21 January and, as is the tradition, was greeted by the entire factory with a toast and an official speech by CEO Claudio Domenicali and Production Manager Silvano Fini. \nThe success of the new power cruiser, begun with its official debut at EICMA 2018, underscores the high levels of interest and expectation this bike is generating among enthusiasts all over the world, Ducatisti and non. Unconventional, unique, unmistakeable: as soon as it was launched at EICMA 2010, the Diavel stunned with its personality, design and sport naked handling. 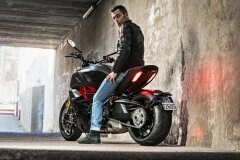 \nThe Diavel 1260 - the second generation of this unique bike - has more assertive lines and higher performance, is more fun on mixed-road routes and even more comfortable for rider and passenger alike. Its sport naked soul is magnified by a Testastretta DVT 1262 engine that combines breath-taking acceleration with the smooth low-rev power delivery that\'s ideal for everyday rides or longer-lasting tours. An upgraded chassis set-up makes the Diavel 1260 surprisingly agile while top-drawer technology and electronics provide braking performance on a par with that of a superbike (and does so safely, thanks to Bosch Cornering ABS) and user-friendly engine performance control. Comfort levels for rider and passenger remain outstanding thanks to an upright riding position, a large, generously padded seat and another Diavel hallmark, the 17" inch rear wheel with its 240 mm wide tyre. \nThe Diavel 1260 is also available as a sportier S version featuring first-rate Öhlins suspension, dedicated wheels, an even higher-performing braking system and Ducati Quick Shift up & down Evo as standard. \nAs of early March the bike will be in UK Ducati dealerships, ready to play a pivotal role in the 2019 motorcycling season. The Diavel 1260 is available in Sandstone Grey, while the Diavel 1260 S goes on sale in Sandstone Grey or Thrilling Black & Dark Stealth. Borgo Panigale, Bologna, 21 January 2019 – The Borgo Panigale plant has begun producing the new Diavel 1260. The first bike rolled off the line on Monday 21 January and, as is the tradition, was greeted by the entire factory with a toast and an official speech by CEO Claudio Domenicali and Production Manager Silvano Fini. 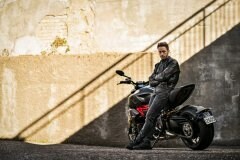 The Diavel 1260 - the second generation of this unique bike - has more assertive lines and higher performance, is more fun on mixed-road routes and even more comfortable for rider and passenger alike. Its sport naked soul is magnified by a Testastretta DVT 1262 engine that combines breath-taking acceleration with the smooth low-rev power delivery that's ideal for everyday rides or longer-lasting tours. An upgraded chassis set-up makes the Diavel 1260 surprisingly agile while top-drawer technology and electronics provide braking performance on a par with that of a superbike (and does so safely, thanks to Bosch Cornering ABS) and user-friendly engine performance control. Comfort levels for rider and passenger remain outstanding thanks to an upright riding position, a large, generously padded seat and another Diavel hallmark, the 17" inch rear wheel with its 240 mm wide tyre. The Diavel 1260 is also available as a sportier S version featuring first-rate Öhlins suspension, dedicated wheels, an even higher-performing braking system and Ducati Quick Shift up & down Evo as standard. As of early March the bike will be in UK Ducati dealerships, ready to play a pivotal role in the 2019 motorcycling season. The Diavel 1260 is available in Sandstone Grey, while the Diavel 1260 S goes on sale in Sandstone Grey or Thrilling Black & Dark Stealth.